FAQ Safety Q- Would removal of the dam help alleviate upstream flooding problems suffered by residents of the Family Farm neighborhood in Woodside? A- Yes. As the elevation of the reservoir and trapped sediment were lowered, upstream flooding issues caused by the dam are expected to be eliminated. Q- How would removal of the dam affect flooding of San Francisquito Creek downstream? A- Searsville Dam was not designed to provide any flood protection benefit downstream and has caused flooding upstream. The dam removal design plan can maximize flood protection benefits to downstream communities. The valley and historic wetlands that are buried beneath Searsville Dam and Reservoir once provided natural flood protection benefits by filling and absorbing winter rains and then slowly releasing flows following the peak flow event. All over the nation, restoration projects are being constructed that restore historic wetlands and adjacent riparian overflow areas to provide the dual benefits of ecosystem restoration and natural flood protection. In addition, dam removal efforts nationwide are being awarded funding to precede the dam removal with major downstream flood protection projects to increase channel capacity, replace undersized bridges, improve levee systems, and ensure that flood risks are reduced with the project. This is an unprecedented opportunity to get massive funding and ease of permitting to reduce flooding, restore ecosystem health, and rebuild Stanford’s out-dated water supply facilities to a modern and sustainable state. Q- Is Searsville Dam safe? A- While the dam was well built, the average age for a dam is reported, by Stanford, to be 40 years and Searsville Dam is 120 years old. Dams are known to degrade over time. Large cracks that remain on the dam were observed by the dam caretaker immediately after the 1906 earthquake. It is not known what the current structural condition of the dam is because it has been 43 years since the Division of Safety of Dams (DSOD) has inspected the foundation, toe, and groins of the dam. Many earthquakes and several decades have past since this last detailed foundation inspection. Stanford is responsible for coordinating this inspection that DSOD has identified in the above 2007 inspection report as a “prudent” measure that should be taken. Beyond Searsville Dam requested that the DSOD require this study and they have informed Stanford that the study should happen before the end of 2012. As the dam and concrete continue to age, experience additional earthquakes, and as the reservoir fills in and transported sediment potentially scours the dam, the structural integrity is expected to be reduced over time. 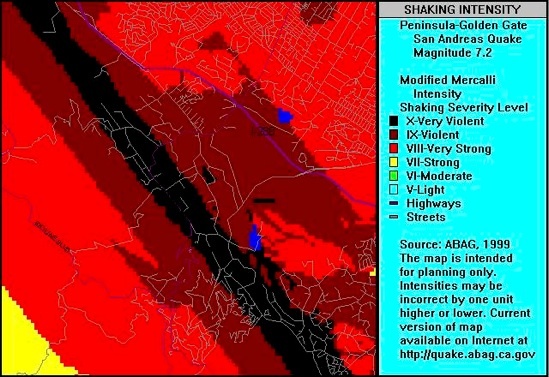 The active San Andreas Fault run adjacent to Searsville Reservoir, which can be seen as the oval blue shape near the center of the map, adjacent to the highest “Very-Violent” shaking severity level on the above image. Dam removal can eliminate the dam failure risk identified by San Mateo County and extensive downstream inundation. Searsville Dam is listed as a “High Hazard” dam by the US Army Corps, State of California, and San Mateo County (pg. 5). As noted in the above document, a High Hazard dam is defined as a dam whose failure would result in “probable loss of lives and significant property damage”. 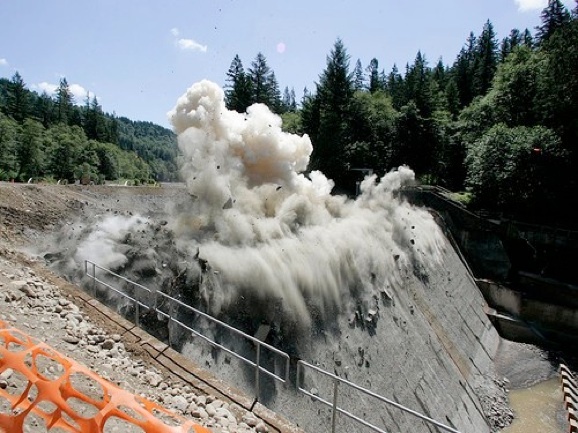 Stanford’s own report, SPEAR3, cites an analysis that determined failure of Searsville Dam could release a “catastrophic” flow of 60,433 cubic feet per second, or “about 6 times the 500-year peak flow of 10,500 cfs” (Section 7.1 Page 7). In addition to geologic, aging, and seismic considerations, the dam’s limited spillway design and operation and bypass flow drain pipe present additional safety challenges for dealing with dam overtopping during flood events and the ability to quickly drain the reservoir during an emergency. Do we know enough to claim that the dam is safe? Existing Facilities Q- Stanford currently uses the reservoir for non-potable water use, such as irrigation, landscaping and fire-fighting. What would replace this water supply? A- As with other completed dam removals, this project design would maintain or replace existing owner needs with improved facilities and ease of operation. Searsville Dam provides a moderate amount of water that can easily be replaced with a less harmful water diversion facility that allows for improved functionality to Stanford. The shrinking reservoir provides a fading amount of storage capacity that can be replaced with existing off-stream reservoirs, expanded storage areas, new off-stream storage, and possible dredging of the remaining upper Searsville Reservoir areas. New diversion facilities can tie into existing storage facilities, irrigation, and landscaping pipelines and improve water delivery. The remaining upper reservoir, west of Portola Road, is an historic wetland pond that preceded the construction of Searsville Dam. This pond can be maintained and continue to provide fire-fighting needs as well as water storage capacity and open-water wetland habitat benefits. As part of the larger Searsville Dam removal and ecosystem restoration project, Stanford has an unprecedented opportunity to upgrade their water delivery and storage facilities with the benefit of available grant funding, eliminated safety liability, and ease of permitting. In addition, the upgraded water diversion and storage facilities can be designed to serve a critical secondary function of reducing flooding downstream by diverting and storing peak storm flows into collection basins as is being considered by the Joint Powers Authority in the watershed. Such multi-objective funding and permitting opportunities are being jumped at by dam owners across the country. Costs Q- Won’t dam removal cost too much? A- Recent studies and completed dam removal efforts have shown that dam removal is almost always less expensive than eventual dam safety retrofitting, installation of required fish passage facilities, and ongoing maintenance costs. Q- Who would pay the millions of dollars needed for studies and possible removal? A- Fortunately, there are many sources of funding for dam removal and ecosystem restoration projects of this kind. Federal, state, local, private, and non-profit entities are all providing large grants and donations to dam removal efforts nationwide. Almost all dam removal studies and construction efforts are being partially or fully funded with these available grants. One state agency, the Department of Water Resources, already offered to study alternatives at Searsville Dam, including removal, at no cost to Stanford. The offer was not accepted. Ecosystem Stagnant, warming water and algae bloom in Searsville Reservoir. Q- What would happen to the ecosystem that has been evolving over the last century? A- The existing ecosystem has emerged around an artificial and unsustainable reservoir that is filling in with sediment. Some of the current vegetation and habitat that has grown up on the upstream end of the reservoir can be maintained with the dam removal design. In addition, miles of historic stream, riparian, and wetland habitat currently buried can be revived and restored with the dam removal. The artificial reservoir ecosystem also currently harbors many exotic species of fish and frogs, which would be eliminated or drastically reduced in numbers, benefiting native species. Water quality and habitat conditions downstream are expected to improve with dam removal, as has been the case elsewhere. Dam removal would also allow for the resurgence of annual steelhead trout runs to the watershed’s largest tributary for the first time in 120 years, bringing back a critical keystone species to the ecosystem. The altered and artificial ecosystem would be transformed to a self-sustainable and native one. Q- What effects would removal -- including possible flushing of sediment -- have on the recovering population of steelhead elsewhere in the watershed? A- The dam has held back sediment for over a century and altered the natural flow of gravels and beneficial sediments downstream creating a “hungry water” situation that has impacted bank erosion and the native habitat for steelhead. Dam removal would provide additional spawning gravels below the dam for steelhead as well as more natural water flow regimes and anticipated improvements to water quality. The existing downstream steelhead population is able to migrate up all other existing spawning and rearing tributaries in the watershed and away from any potential short-term disturbances from the dam removal. As observed with other dam removal efforts, such as the Marmot Dam removal in Oregon, wild salmon and steelhead migrated upstream of the removed dam within several days of it being removed and reestablished themselves into historic habitat, expanding their distribution and improving their population health. Dam removal projects have consistently shown a strong benefit to salmon and steelhead populations in watersheds across the world. Removal of Searsville Dam would open up over ten miles of historic spawning and rearing habitat in the largest tributary of the entire watershed, where high quality habitat and native rainbow trout persist. Corte Madera Creek and the many tributary streams (above) contain excellent habitat and continues to support wild, rainbow trout (below), which are the descendants of sea-run steelhead. These native trout are genetically isolated by the dam and their survival is at risk due to inbreeding and loss of genetic diversity. Dam removal would end this isolation. Q- The current wetlands support a rich bird habitat and foraging ground for bats – would this be protected with the removal? A- Some of the recently established wetlands and habitat utilized by birds and bats can remain with dam removal and design plans would maximize the protection of sensitive areas in a manner similar to other successful dam removal efforts. It is critical to understand that while the artificial, and disappearing, open-water reservoir habitat will be reduced, the historic and ecologically unique habitat buried by the dam and reservoir will be restored. Several miles of stream habitat and associated riparian forests, comprising over 6 different tributary streams, can be reestablished. Biologically-rich wetland ponds and seasonal overflow wetland areas that are currently covered by the reservoir can be restored along with acres of transitional and upland habitat. An amazing and diverse array of habitat types and species will be restored for birds, bats, steelhead, and the full array of native species. In addition, the dam removal will reestablish critical wildlife migration routes at this confluence of riparian corridors currently blocked by the dam and submerged by the reservoir. The remaining, and historic, upper pond located west of Portola Road can continue to provide open-water wetland habitat. Stanford officials have often wondered about the impacts of dam removal on vegetation established on the reservoir and possible negative impacts to neotropical migrant birds that have been observed here in high abundance. In discussing the recently completed Giacomini Wetlands restoration project in Point Reyes Station, a 2009 Bay Nature magazine article states that following a dam and levee removal restoration project; “Neotropical migrant birds that already breed here (Giacomimi Wetland) should become more numerous as wider riparian borders develop along the creeks.” Searsville Dam removal would restore miles of currently buried streams, riparian forests and thick border habitats, and increase the amount of highly productive fringe wetland habitat that these riparian zones provide. In addition, much of the established riparian vegetation at the upper end of Searsville Reservoir could remain with the dam removal design. Overall, the project could trade in the unsustainable, artificial, reservoir habitat for a net gain in stream habitat, riparian forest habitat, fringe wetland habitat, historic wetland ponds, and upland habitat. The historic map below shows what this habitat looked like before the dam and what it can look like again with dam removal and ecosystem restoration. Q-What risks of invasive species would arise with the removal, or altering, of the dam? A- Dam removal will eliminate the artificial reservoir habitat that currently allows for the breeding and dispersal of several exotic and invasive species that prey upon and compete with the native species. Several species of non-native bass, sunfish, and panfish as well as bullfrogs occur in the warm, artificial, flat-water of Searsville Reservoir. These species are able to breed in this artificial habitat and spread downstream of the reservoir were they can prey on and compete with threatened steelhead trout, other native aquatic species; including amphibians and even small birds and mammals. Dam removal and ecosystem restoration plans can minimize the risk of additional exotic species becoming established during the restoration effort and help to minimize future exotic introductions. Most of the non-native species utilizing Searsville Reservoir cannot thrive in the natural flowing stream environment. Logistics Q- Isn’t dam removal too technically challenging? A- Dozens of large dams have been successfully removed and hundreds of medium and smaller dams have been taken out over the past couple decades. Much more complicated dam removals have been completed that involved hydro-power replacement, polluted sediment disposal, adjacent development, and other challenges that this project would not have. Habitat restoration of this size has been successfully completed at hundreds of locations and many dam removal projects have enabled stream habitat and native wildlife to restore themselves quickly. Marmot Dam removal restored the Sandy River in Oregon, 2008. Q- Have there been other successful dam removals that are similar to Searsville? A- Over 500 dams have been removed in the United States in recent years and several dams that were about the size of Searsville, and larger, have recently been removed from rivers around the country. There are also several dams that are planned for removal over the next couple years that are many times larger in size and in the amount of stored sediment. See our Dam Blog page and American Rivers website for more information on completed and planned dam removal projects. Q- What would be done with all the trapped sediment behind the dam? A- Unique opportunities exist for sediment management. A portion of the sediment can be transported for other uses, including the stated desire for it at planned San Francisco Bay wetland restoration projects or nearby agricultural sites. Some sediment can also be stabilized on site with existing vegetation in left intact. Other sediment alternatives such as slurry piping and controlled sediment transport can be utilized to design the best plan to address project complexities. A combination of multiple sediment options has been used in other dam removal efforts and may provide the best way to deal with the sediment. A detailed Dam Removal Alternatives Analysis study would identify the many options available. The mouth of San Francisquito Creek (above) is near several wetland restoration projects in need of sediment. Q- How would the removal of 60 feet of concrete blocks affect the biological preserve and surrounding communities? A- Removal of the concrete blocks would be a short-term disturbance to the Jasper Ridge Biological Preserve and surrounding communities. All efforts would be made to reduce these disturbances and minimize impacts. Noise abatement methods, scheduled use of roads by trucks, use of cleaner burning biodiesel in equipment operation, working around Preserve activities and research, and other determined actions could be implemented to reduce impacts. As with so many other recently completed dam removal efforts, project stakeholders decided that the long-term gains to the ecosystem, dam owner, and surrounding communities warranted the short-term disturbance of dam removal. Q- What are alternatives to removing the dam? A- Doing nothing at the dam and reservoir is not an option that any stakeholders are currently considering or embracing due to the imminent negative impacts of such a non-action. Lowering the dam has been considered, but has limited benefits. Dredging the reservoir and maintaining some open water has also been considered, but has limited benefits and most of the existing ecosystem and safety problems with the dam would remain. Only dam removal has the combined benefits of eliminating the safety liability of the dam, providing a free flowing stream, restoring historic habitat (wetland, stream, riparian), eliminating or reducing non-native species, providing unimpeded steelhead migration, and providing natural flood protection features. Collaboration Q- How will you work with Jasper Ridge Biological Preserve and other watershed stakeholders to ensure their concerns are being met? A- Members and supporters of the Beyond Searsville Dam Coalition have been collaborating with Jasper Ridge Biological Preserve, Stanford University, San Francisquito Joint Powers Authority, San Francisquito Watershed Project, local jurisdictions, government agencies, community groups, and other non-profit groups for several decades on a variety of watershed related projects. We will continue to work with all of these stakeholders to address their concerns, as we feel that the safety and ecosystem issues are in our mutual interest and that the most effective project will occur when shared goals are best addressed. We firmly believe that a collaborative, well-designed dam removal effort can be in the best interest of Stanford University and the entire watershed community. Jasper Ridge Biological Preserve Director, Philippe Cohen (green cap), and Stanford Engineering Professor, David Freyberg (at right), atop Searsville Dam talking to a group from the Salmonid Restoration Federation conference who were interested in dam removal. 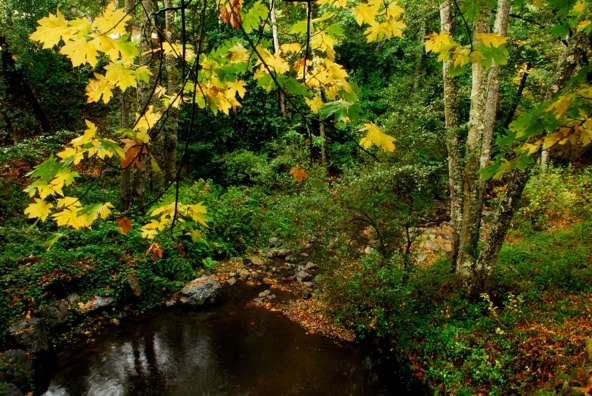 While many progressive leaders at Stanford acknowledge the potential benefits of dam removal and the need for comprehensive studies to analyze specific dam removal alternatives, many watershed stakeholders are concerned that several individuals at Stanford are misrepresenting the issue and standing in the way of productive collaboration and investigation on this critical watershed decision that impacts all stakeholders. Dam Removal: Frequently asked questions (FAQs) 1) What is a dam? There are a number of technical and legal definitions of a dam but generally it is any structure that impounds or diverts water. 2) How many dams are there in the United States? The exact number of dams is not known. There are approximately 75,000 dams in the US Army Corps of Engineers' (Corps) National Inventory of Dams (NID), which is the most comprehensive inventory of dams nationwide. However, this inventory only covers dams that meet minimum height and impoundment requirements, so an unknown number of small dams are not included in the inventory. Of the 75,000 dams in the database, approximately 66,000 are located on rivers (the remainder impound water off-river). 3) Which state has the most dams? According to the NID, Texas has the most dams of any state at 6,798. 4) Who regulates dam operations? A number of state and federal agencies are responsible for regulating dams. Dams owned by federal agencies are self-regulated. Non-federal dams that produce hydropower are regulated by the Federal Energy Regulatory Commission (FERC). Non-federal dams that do not produce hydropower are regulated by the state in which they reside. Often this state regulation is focused on dam safety. 5) How many dams actually produce power? FERC regulates approximately 2,300 hydroelectric producing dams. In addition, there are approximately 240 federal dams that produce hydroelectric power. Thus, there are a total of approximately 2,540 hydropower dams. 6) What is the largest dam in the country? The size of a dam can be measured in a number of different ways. According to the NID, Oroville Dam, on the Feather River in California, is the tallest dam in the United States, measuring in at 770 ft. The dam with the largest impoundment is Hoover Dam, on the Colorado River in Nevada, which stores approximately 30 million acre-feet of water. The dam that provides the most hydroelectric power in the United States is Grand Coulee Dam, on the Columbia River in Washington, which generates 6180 megawatts (MW) of power. 7) Why are some dams being removed? There has been a growing movement to remove dams where the costs - including environmental, safety, and socio-cultural impacts - outweigh the benefits - including hydropower, flood control, irrigation, or recreation - or where the dam no longer serves any useful purpose. The goal of removal can be multi-faceted, including restoring flows for fish and wildlife, reinstating the natural sediment and nutrient flow, eliminating safety risks, restoring opportunities for whitewater recreation, and saving taxpayer money. 8) How are dams removed? Because dams and rivers vary greatly, physical removal strategies and techniques may also vary on a case by case basis. Generally, the process involves drawing down the reservoir, potentially removing the sediment built up behind the dam, removing the structure, and mitigating for downstream effects of increased flow and sediment re-suspension. Techniques may include the use of controlled explosions and heavy demolition equipment. 9) How many dams have been removed to date? Currently, American Rivers is aware of more than 600 dams that have been removed over the past 50 years in this country. We are still in the process of gathering this data, so that figure is likely to increase as more information becomes available. [Find out more on recent dam removals] 10) How much does it cost to remove a dam? Because the size and location of dams vary so greatly, the cost to remove an individual dam can range from tens of thousands of dollars to hundreds of millions of dollars. 11) Who owns the dams that are being removed? Private businesses, federal agencies, state agencies, local governments, or public utilities may own dams. Most of the dams removed to date have been owned privately, by local government, or by public utilities. 12) Who pays for dam removal? Who pays for the removal of a dam is often a complex issue. In past cases, removal has been financed by the dam owner, local, state and federal governments, and in some cases agreements whereby multiple stakeholders contribute to cover the costs. 13) Who decides that dams should be removed? The decision to remove a dam is made by varying entities, depending on the regulatory oversight of the dam. In most cases, the dam owner itself is the decision-maker, often deciding that the costs of continuing to operate and maintain the dam are more than removing the dam. State dam safety offices can often order a dam to be removed if there are major safety concerns. The Federal Energy Regulatory Commission can order a hydropower dam under their jurisdiction to be removed for both environmental and safety reasons. 14) Can rivers be restored through dam removal? Although most rivers cannot be completely restored to historic conditions - simply because of the amount of development that has occurred on and along them - dam removal can often recreate conditions that move the river towards those historic conditions. For example, fish are returning to historic stretches of river that had been previously obstructed on Butte Creek in California, the Souadabscook River in Maine, and the Clearwater River in Idaho, as a result of dam removals. [Find out more on dam removal success stories] 15) What benefits do dams provide? Dams may provide a variety of benefits, including water supply, power generation, flood control, recreation, and irrigation. 16) How can the benefits of a dam be replaced when it is removed? While dams serve a number of human needs, society has developed ways to address many of these needs without dams. For instance, flood control can often be accomplished more effectively and for less money by restoring wetlands, maintaining riparian buffers, or moving people out of the floodplain. Updating antiquated irrigation systems and replacing inappropriate crops can dramatically reduce the need for dams and reservoirs in the arid West. Rather than plugging rivers with multiple hydropower dams, a cheaper and less environmentally harmful solution is to use existing energy efficiency technologies. For example, the 3MW of power lost in the removal of the Edwards Dam, on the Kennebec River in Maine, can be replaced simply by replacing 75,000 light bulbs with energy efficient bulbs. Many dams that have been removed no longer had any beneficial use or that use was very limited. 17) Is it cost effective to remove a dam? Dam removal can be expensive in the short term, but in most cases where dams have been removed or are being considered for removal, money is actually saved over the long term. Removal eliminates the expenses associated with maintenance and safety as well as direct and indirect expenses associated with fish and wildlife protection (e.g. fish ladders and mitigation for fish mortality). In addition, removal often generates income from newly available recreation opportunities - including fishing, kayaking, and rafting - which may actually result in a net economic benefit. In some areas, dam removal may allow resumption of commercial fishing activities. 18) Will the removal of a dam matter if other dams in the system are not removed? Some rivers are so heavily developed and dammed that removal of one dam on that river will only return flows to a small portion of the river. Generally, dams that have been targeted for removal are strategically located - removal will open up a section of the river critical to fish and wildlife and/or recreation. In some cases, this additional section of river is enough to sustain crucial populations of endangered or threatened species of fish, mollusks, and other wildlife. 19) Are we going to decide in twenty years that we need to start building dams again? We have learned a lot in the past twenty years about the many impacts dams have on rivers, and we have learned many alternatives to damming rivers. The combination of these two lessons is leading to dam removal. In the next twenty years we are likely to learn even more about alternatives to dams and the impacts of dams on rivers. Thus, it is unlikely that we will reverse ourselves and decide to build more dams. 20) How does dam removal affect fish? Dam removal benefits riverine fish in many ways, including: (1) removing obstructions to upstream and downstream migration; (2) restoring natural riverine habitat; (3) restoring natural seasonal flow variations; (4) eliminating siltation of spawning and feeding habitat above the dam; (5) allowing debris, small rocks and nutrients to pass below the dam, creating healthy habitat; (6) eliminating unnatural temperature variations below the dam; and (7) removing turbines that kill fish. 21) What are the potential downsides to dam removal? Dam removal does result in fundamental changes to the local environment. The reservoir will be eliminated, and with it the flat-water habitat that had been created. Wetlands surrounding the reservoir will also be drained, although new wetlands are often created both in the newly restored river reach above the former dam site and in the river below. Sediment that collects behind a dam, sometimes over hundreds of years, may contain toxics such as PCBs, dioxide, and heavy metals. Re-suspension of these toxic-laden sediments in the process of dam removal has the potential to damage downstream water quality and threaten the health of fish and wildlife and water users. Short term impacts of the dam removal itself can include increased water turbidity and sediment buildup downstream from releasing large amounts of sediment from the reservoir, and water quality impacts from sudden releases of water and changes in temperature. These impacts, however, can be prevented through proper removal techniques. How quickly do rivers recover after dam removal? Rivers are very dynamic and resilient systems. Experience has shown that natural river systems can be restored relatively rapidly after dam removal. For example, spawning fish returned to the Souadabscook River in Maine only months after a dam was removed, and the flushing of the sediment from the Milwaukee River in Wisconsin following the Woolen Mills Dam removal took only six months. Click here to sign up for our e-newsletter. Q- Would removal of the dam help alleviate upstream flooding problems suffered by residents of the Family Farm neighborhood in Woodside? A- Yes. As the elevation of the reservoir and trapped sediment were lowered, upstream flooding issues caused by the dam are expected to be eliminated. Q- How would removal of the dam affect flooding of San Francisquito Creek downstream? A- Searsville Dam was not designed to provide any flood protection benefit downstream and has caused flooding upstream. The dam removal design plan can maximize flood protection benefits to downstream communities. The valley and historic wetlands that are buried beneath Searsville Dam and Reservoir once provided natural flood protection benefits by filling and absorbing winter rains and then slowly releasing flows following the peak flow event. All over the nation, restoration projects are being constructed that restore historic wetlands and adjacent riparian overflow areas to provide the dual benefits of ecosystem restoration and natural flood protection. In addition, dam removal efforts nationwide are being awarded funding to precede the dam removal with major downstream flood protection projects to increase channel capacity, replace undersized bridges, improve levee systems, and ensure that flood risks are reduced with the project. This is an unprecedented opportunity to get massive funding and ease of permitting to reduce flooding, restore ecosystem health, and rebuild Stanford’s out-dated water supply facilities to a modern and sustainable state. Q- Is Searsville Dam safe? A- While the dam was well built, the average age for a dam is reported, by Stanford, to be 40 years and Searsville Dam is 120 years old. Dams are known to degrade over time. Large cracks that remain on the dam were observed by the dam caretaker immediately after the 1906 earthquake. It is not known what the current structural condition of the dam is because it has been 43 years since the Division of Safety of Dams (DSOD) has inspected the foundation, toe, and groins of the dam. Many earthquakes and several decades have past since this last detailed foundation inspection. Stanford is responsible for coordinating this inspection that DSOD has identified in the above 2007 inspection report as a “prudent” measure that should be taken. Beyond Searsville Dam requested that the DSOD require this study and they have informed Stanford that the study should happen before the end of 2012. As the dam and concrete continue to age, experience additional earthquakes, and as the reservoir fills in and transported sediment potentially scours the dam, the structural integrity is expected to be reduced over time. The active San Andreas Fault run adjacent to Searsville Reservoir, which can be seen as the oval blue shape near the center of the map, adjacent to the highest “Very-Violent” shaking severity level on the above image. Dam removal can eliminate the dam failure risk identified by San Mateo County and extensive downstream inundation. Searsville Dam is listed as a “High Hazard” dam by the US Army Corps, State of California, and San Mateo County (pg. 5). As noted in the above document, a High Hazard dam is defined as a dam whose failure would result in “probable loss of lives and significant property damage”. Stanford’s own report, SPEAR3, cites an analysis that determined failure of Searsville Dam could release a “catastrophic” flow of 60,433 cubic feet per second, or “about 6 times the 500-year peak flow of 10,500 cfs” (Section 7.1 Page 7). In addition to geologic, aging, and seismic considerations, the dam’s limited spillway design and operation and bypass flow drain pipe present additional safety challenges for dealing with dam overtopping during flood events and the ability to quickly drain the reservoir during an emergency. Do we know enough to claim that the dam is safe? Q- Stanford currently uses the reservoir for non-potable water use, such as irrigation, landscaping and fire-fighting. What would replace this water supply? A- As with other completed dam removals, this project design would maintain or replace existing owner needs with improved facilities and ease of operation. Searsville Dam provides a moderate amount of water that can easily be replaced with a less harmful water diversion facility that allows for improved functionality to Stanford. The shrinking reservoir provides a fading amount of storage capacity that can be replaced with existing off-stream reservoirs, expanded storage areas, new off-stream storage, and possible dredging of the remaining upper Searsville Reservoir areas. New diversion facilities can tie into existing storage facilities, irrigation, and landscaping pipelines and improve water delivery. The remaining upper reservoir, west of Portola Road, is an historic wetland pond that preceded the construction of Searsville Dam. This pond can be maintained and continue to provide fire-fighting needs as well as water storage capacity and open-water wetland habitat benefits. As part of the larger Searsville Dam removal and ecosystem restoration project, Stanford has an unprecedented opportunity to upgrade their water delivery and storage facilities with the benefit of available grant funding, eliminated safety liability, and ease of permitting. In addition, the upgraded water diversion and storage facilities can be designed to serve a critical secondary function of reducing flooding downstream by diverting and storing peak storm flows into collection basins as is being considered by the Joint Powers Authority in the watershed. Such multi-objective funding and permitting opportunities are being jumped at by dam owners across the country. Q- Won’t dam removal cost too much? A- Recent studies and completed dam removal efforts have shown that dam removal is almost always less expensive than eventual dam safety retrofitting, installation of required fish passage facilities, and ongoing maintenance costs. Q- Who would pay the millions of dollars needed for studies and possible removal? A- Fortunately, there are many sources of funding for dam removal and ecosystem restoration projects of this kind. Federal, state, local, private, and non-profit entities are all providing large grants and donations to dam removal efforts nationwide. Almost all dam removal studies and construction efforts are being partially or fully funded with these available grants. One state agency, the Department of Water Resources, already offered to study alternatives at Searsville Dam, including removal, at no cost to Stanford. The offer was not accepted. Stagnant, warming water and algae bloom in Searsville Reservoir. Q- What would happen to the ecosystem that has been evolving over the last century? A- The existing ecosystem has emerged around an artificial and unsustainable reservoir that is filling in with sediment. Some of the current vegetation and habitat that has grown up on the upstream end of the reservoir can be maintained with the dam removal design. In addition, miles of historic stream, riparian, and wetland habitat currently buried can be revived and restored with the dam removal. The artificial reservoir ecosystem also currently harbors many exotic species of fish and frogs, which would be eliminated or drastically reduced in numbers, benefiting native species. Water quality and habitat conditions downstream are expected to improve with dam removal, as has been the case elsewhere. Dam removal would also allow for the resurgence of annual steelhead trout runs to the watershed’s largest tributary for the first time in 120 years, bringing back a critical keystone species to the ecosystem. The altered and artificial ecosystem would be transformed to a self-sustainable and native one. Q- What effects would removal -- including possible flushing of sediment -- have on the recovering population of steelhead elsewhere in the watershed? A- The dam has held back sediment for over a century and altered the natural flow of gravels and beneficial sediments downstream creating a “hungry water” situation that has impacted bank erosion and the native habitat for steelhead. Dam removal would provide additional spawning gravels below the dam for steelhead as well as more natural water flow regimes and anticipated improvements to water quality. The existing downstream steelhead population is able to migrate up all other existing spawning and rearing tributaries in the watershed and away from any potential short-term disturbances from the dam removal. 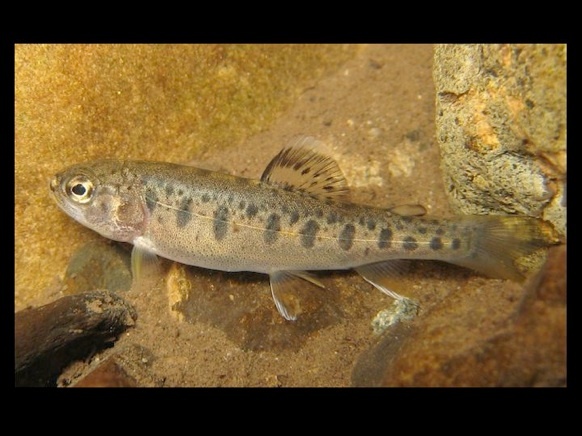 As observed with other dam removal efforts, such as the Marmot Dam removal in Oregon, wild salmon and steelhead migrated upstream of the removed dam within several days of it being removed and reestablished themselves into historic habitat, expanding their distribution and improving their population health. Dam removal projects have consistently shown a strong benefit to salmon and steelhead populations in watersheds across the world. Removal of Searsville Dam would open up over ten miles of historic spawning and rearing habitat in the largest tributary of the entire watershed, where high quality habitat and native rainbow trout persist. 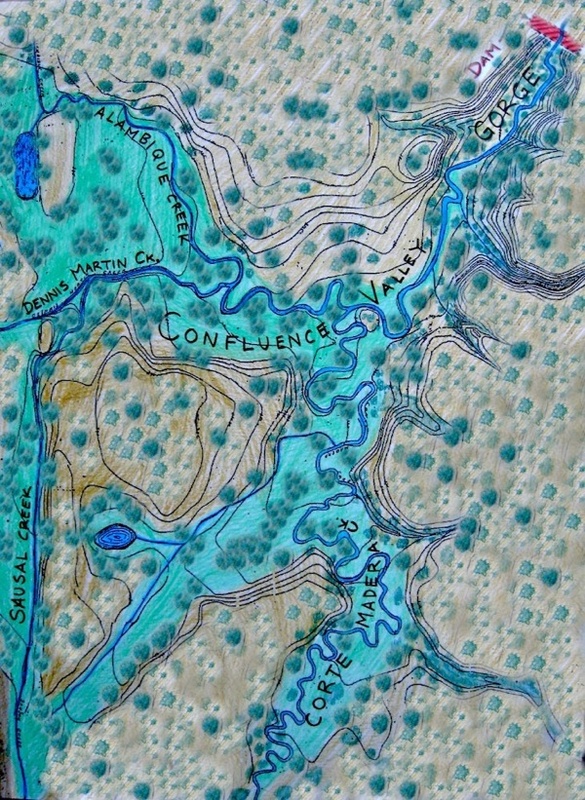 Corte Madera Creek and the many tributary streams (above) contain excellent habitat and continues to support wild, rainbow trout (below), which are the descendants of sea-run steelhead. These native trout are genetically isolated by the dam and their survival is at risk due to inbreeding and loss of genetic diversity. Dam removal would end this isolation. Q- The current wetlands support a rich bird habitat and foraging ground for bats – would this be protected with the removal? A- Some of the recently established wetlands and habitat utilized by birds and bats can remain with dam removal and design plans would maximize the protection of sensitive areas in a manner similar to other successful dam removal efforts. It is critical to understand that while the artificial, and disappearing, open-water reservoir habitat will be reduced, the historic and ecologically unique habitat buried by the dam and reservoir will be restored. Several miles of stream habitat and associated riparian forests, comprising over 6 different tributary streams, can be reestablished. Biologically-rich wetland ponds and seasonal overflow wetland areas that are currently covered by the reservoir can be restored along with acres of transitional and upland habitat. An amazing and diverse array of habitat types and species will be restored for birds, bats, steelhead, and the full array of native species. In addition, the dam removal will reestablish critical wildlife migration routes at this confluence of riparian corridors currently blocked by the dam and submerged by the reservoir. The remaining, and historic, upper pond located west of Portola Road can continue to provide open-water wetland habitat. Searsville Dam removal would restore miles of currently buried streams, riparian forests and thick border habitats, and increase the amount of highly productive fringe wetland habitat that these riparian zones provide. In addition, much of the established riparian vegetation at the upper end of Searsville Reservoir could remain with the dam removal design. Overall, the project could trade in the unsustainable, artificial, reservoir habitat for a net gain in stream habitat, riparian forest habitat, fringe wetland habitat, historic wetland ponds, and upland habitat. The historic map below shows what this habitat looked like before the dam and what it can look like again with dam removal and ecosystem restoration. Q-What risks of invasive species would arise with the removal, or altering, of the dam? A- Dam removal will eliminate the artificial reservoir habitat that currently allows for the breeding and dispersal of several exotic and invasive species that prey upon and compete with the native species. Several species of non-native bass, sunfish, and panfish as well as bullfrogs occur in the warm, artificial, flat-water of Searsville Reservoir. These species are able to breed in this artificial habitat and spread downstream of the reservoir were they can prey on and compete with threatened steelhead trout, other native aquatic species; including amphibians and even small birds and mammals. Dam removal and ecosystem restoration plans can minimize the risk of additional exotic species becoming established during the restoration effort and help to minimize future exotic introductions. Most of the non-native species utilizing Searsville Reservoir cannot thrive in the natural flowing stream environment. Q- Isn’t dam removal too technically challenging? A- Dozens of large dams have been successfully removed and hundreds of medium and smaller dams have been taken out over the past couple decades. Much more complicated dam removals have been completed that involved hydro-power replacement, polluted sediment disposal, adjacent development, and other challenges that this project would not have. Habitat restoration of this size has been successfully completed at hundreds of locations and many dam removal projects have enabled stream habitat and native wildlife to restore themselves quickly. Marmot Dam removal restored the Sandy River in Oregon, 2008. 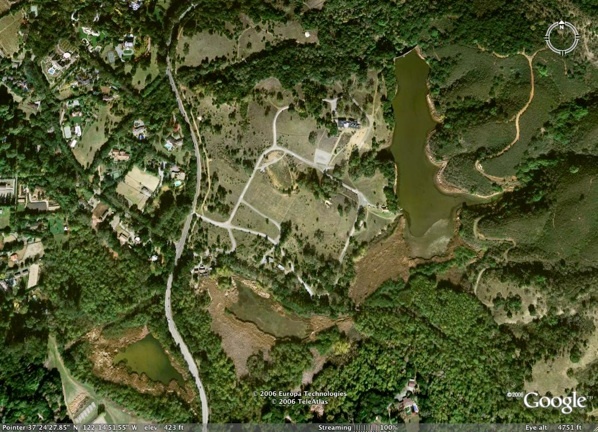 Q- Have there been other successful dam removals that are similar to Searsville? A- Over 500 dams have been removed in the United States in recent years and several dams that were about the size of Searsville, and larger, have recently been removed from rivers around the country. There are also several dams that are planned for removal over the next couple years that are many times larger in size and in the amount of stored sediment. See our Dam Blog page and American Rivers website for more information on completed and planned dam removal projects. Q- What would be done with all the trapped sediment behind the dam? A- Unique opportunities exist for sediment management. 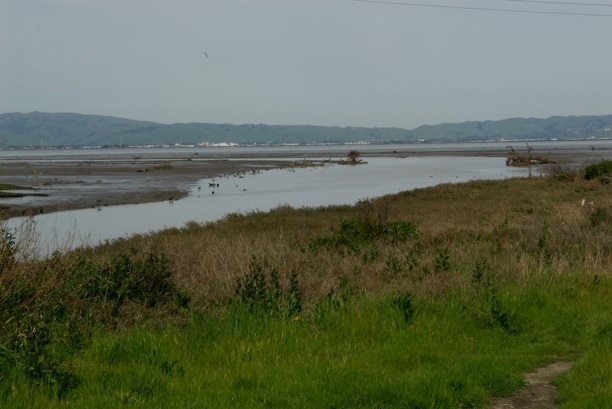 A portion of the sediment can be transported for other uses, including the stated desire for it at planned San Francisco Bay wetland restoration projects or nearby agricultural sites. Some sediment can also be stabilized on site with existing vegetation in left intact. Other sediment alternatives such as slurry piping and controlled sediment transport can be utilized to design the best plan to address project complexities. A combination of multiple sediment options has been used in other dam removal efforts and may provide the best way to deal with the sediment. A detailed Dam Removal Alternatives Analysis study would identify the many options available. The mouth of San Francisquito Creek (above) is near several wetland restoration projects in need of sediment. Q- How would the removal of 60 feet of concrete blocks affect the biological preserve and surrounding communities? A- Removal of the concrete blocks would be a short-term disturbance to the Jasper Ridge Biological Preserve and surrounding communities. All efforts would be made to reduce these disturbances and minimize impacts. Noise abatement methods, scheduled use of roads by trucks, use of cleaner burning biodiesel in equipment operation, working around Preserve activities and research, and other determined actions could be implemented to reduce impacts. As with so many other recently completed dam removal efforts, project stakeholders decided that the long-term gains to the ecosystem, dam owner, and surrounding communities warranted the short-term disturbance of dam removal. Q- What are alternatives to removing the dam? A- Doing nothing at the dam and reservoir is not an option that any stakeholders are currently considering or embracing due to the imminent negative impacts of such a non-action. Lowering the dam has been considered, but has limited benefits. Dredging the reservoir and maintaining some open water has also been considered, but has limited benefits and most of the existing ecosystem and safety problems with the dam would remain. Only dam removal has the combined benefits of eliminating the safety liability of the dam, providing a free flowing stream, restoring historic habitat (wetland, stream, riparian), eliminating or reducing non-native species, providing unimpeded steelhead migration, and providing natural flood protection features. Q- How will you work with Jasper Ridge Biological Preserve and other watershed stakeholders to ensure their concerns are being met? A- Members and supporters of the Beyond Searsville Dam Coalition have been collaborating with Jasper Ridge Biological Preserve, Stanford University, San Francisquito Joint Powers Authority, San Francisquito Watershed Project, local jurisdictions, government agencies, community groups, and other non-profit groups for several decades on a variety of watershed related projects. We will continue to work with all of these stakeholders to address their concerns, as we feel that the safety and ecosystem issues are in our mutual interest and that the most effective project will occur when shared goals are best addressed. We firmly believe that a collaborative, well-designed dam removal effort can be in the best interest of Stanford University and the entire watershed community. 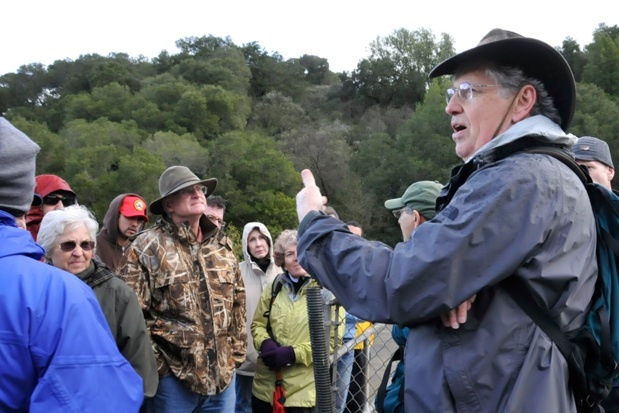 Jasper Ridge Biological Preserve Director, Philippe Cohen (green cap), and Stanford Engineering Professor, David Freyberg (at right), atop Searsville Dam talking to a group from the Salmonid Restoration Federation conference who were interested in dam removal. 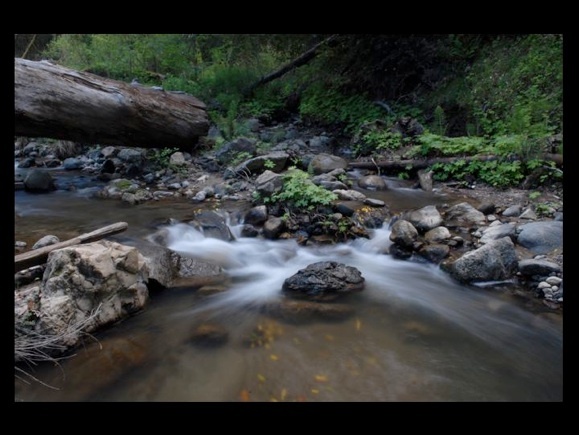 While many progressive leaders at Stanford acknowledge the potential benefits of dam removal and the need for comprehensive studies to analyze specific dam removal alternatives, many watershed stakeholders are concerned that several individuals at Stanford are misrepresenting the issue and standing in the way of productive collaboration and investigation on this critical watershed decision that impacts all stakeholders. 1) What is a dam? There are a number of technical and legal definitions of a dam but generally it is any structure that impounds or diverts water. 2) How many dams are there in the United States? The exact number of dams is not known. There are approximately 75,000 dams in the US Army Corps of Engineers' (Corps) National Inventory of Dams (NID), which is the most comprehensive inventory of dams nationwide. However, this inventory only covers dams that meet minimum height and impoundment requirements, so an unknown number of small dams are not included in the inventory. Of the 75,000 dams in the database, approximately 66,000 are located on rivers (the remainder impound water off-river). 3) Which state has the most dams? According to the NID, Texas has the most dams of any state at 6,798. 4) Who regulates dam operations? A number of state and federal agencies are responsible for regulating dams. Dams owned by federal agencies are self-regulated. Non-federal dams that produce hydropower are regulated by the Federal Energy Regulatory Commission (FERC). Non-federal dams that do not produce hydropower are regulated by the state in which they reside. Often this state regulation is focused on dam safety. 5) How many dams actually produce power? FERC regulates approximately 2,300 hydroelectric producing dams. In addition, there are approximately 240 federal dams that produce hydroelectric power. Thus, there are a total of approximately 2,540 hydropower dams. 6) What is the largest dam in the country? The size of a dam can be measured in a number of different ways. According to the NID, Oroville Dam, on the Feather River in California, is the tallest dam in the United States, measuring in at 770 ft. The dam with the largest impoundment is Hoover Dam, on the Colorado River in Nevada, which stores approximately 30 million acre-feet of water. The dam that provides the most hydroelectric power in the United States is Grand Coulee Dam, on the Columbia River in Washington, which generates 6180 megawatts (MW) of power. 7) Why are some dams being removed? There has been a growing movement to remove dams where the costs - including environmental, safety, and socio-cultural impacts - outweigh the benefits - including hydropower, flood control, irrigation, or recreation - or where the dam no longer serves any useful purpose. The goal of removal can be multi-faceted, including restoring flows for fish and wildlife, reinstating the natural sediment and nutrient flow, eliminating safety risks, restoring opportunities for whitewater recreation, and saving taxpayer money. 8) How are dams removed? Because dams and rivers vary greatly, physical removal strategies and techniques may also vary on a case by case basis. Generally, the process involves drawing down the reservoir, potentially removing the sediment built up behind the dam, removing the structure, and mitigating for downstream effects of increased flow and sediment re-suspension. Techniques may include the use of controlled explosions and heavy demolition equipment. 9) How many dams have been removed to date? 10) How much does it cost to remove a dam? Because the size and location of dams vary so greatly, the cost to remove an individual dam can range from tens of thousands of dollars to hundreds of millions of dollars. 11) Who owns the dams that are being removed? Private businesses, federal agencies, state agencies, local governments, or public utilities may own dams. Most of the dams removed to date have been owned privately, by local government, or by public utilities. 12) Who pays for dam removal? Who pays for the removal of a dam is often a complex issue. In past cases, removal has been financed by the dam owner, local, state and federal governments, and in some cases agreements whereby multiple stakeholders contribute to cover the costs. 13) Who decides that dams should be removed? The decision to remove a dam is made by varying entities, depending on the regulatory oversight of the dam. In most cases, the dam owner itself is the decision-maker, often deciding that the costs of continuing to operate and maintain the dam are more than removing the dam. State dam safety offices can often order a dam to be removed if there are major safety concerns. The Federal Energy Regulatory Commission can order a hydropower dam under their jurisdiction to be removed for both environmental and safety reasons. 14) Can rivers be restored through dam removal? 15) What benefits do dams provide? Dams may provide a variety of benefits, including water supply, power generation, flood control, recreation, and irrigation. 16) How can the benefits of a dam be replaced when it is removed? While dams serve a number of human needs, society has developed ways to address many of these needs without dams. For instance, flood control can often be accomplished more effectively and for less money by restoring wetlands, maintaining riparian buffers, or moving people out of the floodplain. Updating antiquated irrigation systems and replacing inappropriate crops can dramatically reduce the need for dams and reservoirs in the arid West. Rather than plugging rivers with multiple hydropower dams, a cheaper and less environmentally harmful solution is to use existing energy efficiency technologies. For example, the 3MW of power lost in the removal of the Edwards Dam, on the Kennebec River in Maine, can be replaced simply by replacing 75,000 light bulbs with energy efficient bulbs. Many dams that have been removed no longer had any beneficial use or that use was very limited. 17) Is it cost effective to remove a dam? Dam removal can be expensive in the short term, but in most cases where dams have been removed or are being considered for removal, money is actually saved over the long term. Removal eliminates the expenses associated with maintenance and safety as well as direct and indirect expenses associated with fish and wildlife protection (e.g. fish ladders and mitigation for fish mortality). In addition, removal often generates income from newly available recreation opportunities - including fishing, kayaking, and rafting - which may actually result in a net economic benefit. In some areas, dam removal may allow resumption of commercial fishing activities. 18) Will the removal of a dam matter if other dams in the system are not removed? Some rivers are so heavily developed and dammed that removal of one dam on that river will only return flows to a small portion of the river. Generally, dams that have been targeted for removal are strategically located - removal will open up a section of the river critical to fish and wildlife and/or recreation. In some cases, this additional section of river is enough to sustain crucial populations of endangered or threatened species of fish, mollusks, and other wildlife. 19) Are we going to decide in twenty years that we need to start building dams again? We have learned a lot in the past twenty years about the many impacts dams have on rivers, and we have learned many alternatives to damming rivers. The combination of these two lessons is leading to dam removal. In the next twenty years we are likely to learn even more about alternatives to dams and the impacts of dams on rivers. Thus, it is unlikely that we will reverse ourselves and decide to build more dams. 20) How does dam removal affect fish? Dam removal benefits riverine fish in many ways, including: (1) removing obstructions to upstream and downstream migration; (2) restoring natural riverine habitat; (3) restoring natural seasonal flow variations; (4) eliminating siltation of spawning and feeding habitat above the dam; (5) allowing debris, small rocks and nutrients to pass below the dam, creating healthy habitat; (6) eliminating unnatural temperature variations below the dam; and (7) removing turbines that kill fish. 21) What are the potential downsides to dam removal? Dam removal does result in fundamental changes to the local environment. The reservoir will be eliminated, and with it the flat-water habitat that had been created. Wetlands surrounding the reservoir will also be drained, although new wetlands are often created both in the newly restored river reach above the former dam site and in the river below. Sediment that collects behind a dam, sometimes over hundreds of years, may contain toxics such as PCBs, dioxide, and heavy metals. Re-suspension of these toxic-laden sediments in the process of dam removal has the potential to damage downstream water quality and threaten the health of fish and wildlife and water users. Short term impacts of the dam removal itself can include increased water turbidity and sediment buildup downstream from releasing large amounts of sediment from the reservoir, and water quality impacts from sudden releases of water and changes in temperature. These impacts, however, can be prevented through proper removal techniques. 22)How quickly do rivers recover after dam removal? Rivers are very dynamic and resilient systems. Experience has shown that natural river systems can be restored relatively rapidly after dam removal. For example, spawning fish returned to the Souadabscook River in Maine only months after a dam was removed, and the flushing of the sediment from the Milwaukee River in Wisconsin following the Woolen Mills Dam removal took only six months.